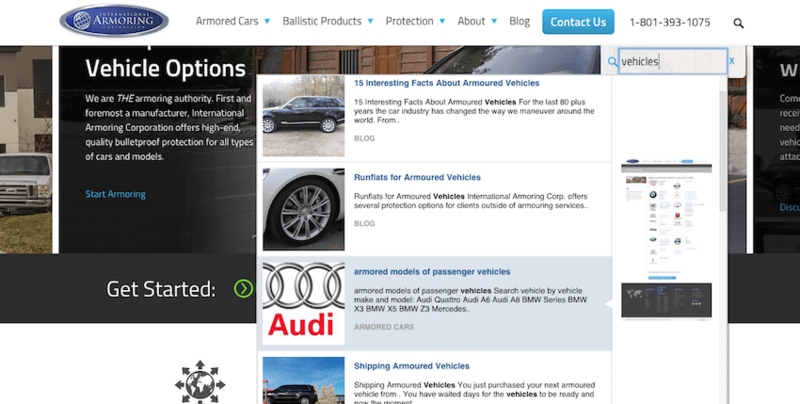 At International Armoring Corporation we are constantly looking for ways to help our clients and web visitors find the exact armored vehicles and products they are looking for on our website, instantly. When we redesigned our website a couple months ago this was one of our most requested features and one we were really excited to incorporate. Search is such an important part of our everyday lives and in a world of “instant” we wanted to make sure the different pages were easier accessible and the visitor could just focus on the content and pictures. The search capability is fully mobile, supports desktops, tables, and phone and can work on any platform. One feature we really enjoy about the search product is that it is visual, so as soon as you click the magnifying glass in our header on the right side and start typing, results will start to appear to give you suggestions on pages you might be interested in clicking on. Our thought is to allow every page the visitor to find anything they need on our site and educate themselves about our company, products, and latest armoring methods. We are constantly adding new content and videos to showcase the different projects we are working on along with security news around the world. We are very happy with our search options and capabilities on the site and hope you can use this feature to find anything you are looking for faster. As the number of pages grow on the website this feature will only be more and more used. This was one of the most request features we had (along with more pictures), and fills and obvious need to anyone trying to navigate a large site. Look forward to making the site more and more helpful over the coming months.